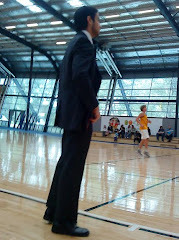 With nbadraft.net down for a server update or something to that effect, I figure I'd do another blog post to keep my mind off my U16s grand final game tomorrow morning. Let's hope we can come up big. But this isn't about my personal life, it's about the NBA. 5. Andre Iguodala: A lot of this comes down to Evan Turner's performance; if he and the rest of the 'Sixers can get back on track then Iggy can be the savage, lock-down defender he was in the FIBA world cup. Keeping in mind he was often playing against 4s and will be guarding 2s and 3s in the NBA he could have a strong year and be a bit of a wildcard. However, as with most wildcards, it is going to need a whole bunch of things going right. 4. Gerald Wallace: How was it that a team which was swept in the first round of the playoffs had such a good record against the number one ranked team in the League last season? Well, his name is Crash, and he did a number of Lebron and the Cavs every time they played. This man is all hustle, and has improved each year under Larry Brown. It wasn't his skill (though considerable) that earned him an All-Star nomination, but his grit and intensity; which just so happens to be the most important thing on the defensive end. A lot of people have Charlotte dropping out, but a fresh commitment from Larry Brown should see the stocks of both the Bobcats and Gerald Wallace rise. 3. Eric Gordon: Okay, before you all close the window and never read the blog again, hear me out; I have never seen such a dominant defensive effort by a guard as I did with Eric Gordon in the world cup. Those of you who followed Team USAs efforts know the one I'm talking about. I can't remember what happened to set him off, but Gordon got pissed, and he absolutely terrorised his opponent for almost the entire shot clock, I'm surprised they didn't have to stop the play to clean up the puddle forming at the dude's feet. There were hands everywhere, and Gordon finished with an emphatic rejection to gain possession for the US again. Now, I know it was only one play and all, but think about the Clippers' situation and Gordon's role on the team; Kaman is coming off an All-Star season, some dude name Blake Griffin is going to be back in uniform and Baron Davis is still kicking around. Gordon is more well known for his shooting, but he showing how dedicated he was to defense, and how impressive he can be on that end of the floor. If he learns from this experience and applies himself as a defensive ace he might just be in with a shot. 1. Dwight Howard: It ain't happening this season. As the two time defending champ, barring a major injury I can't see Howard getting any less athletic or losing his defensive instincts. While he has a very limited offensive skillset and shoots free-throws about as well as the last "Superman", he is considered one of the best players in the League, which gives hope to incoming offensively-challenged shot-blockers like Hassan Whiteside. So there you have my predictions, again they might be a little biased, but I feel there is a strong case for each of these candidates. That said, this is one of the hardest awards to narrow down to 5-7; I could easily have given 10 or more honourable mentions, there are that many ace defenders who could step up. Ah well, what are you gonna do? Hey guys, so we are deep, deep into the off-season right now and trades and signings are mostly settled down. So I figured I'd do a few pre-season predictions starting with Most Improved Player predictions. This is a hard one to pin down because sometimes they factor in draft order and "expected growth" when giving out the award, so its difficult for a high draft pick to get it. But what the hell, let's go for my top 5 MIP predictions. 5. Nicolas Batum: Batum has great athleticism, and if he can just put together a 70+ game season he should capitalise on a wealth of talent and potential. With Webster and Outlaw gone, Luke Babbitt is the only threat to his PT at the 3 which can be either a good thing or a bad thing. However, a strong showing for France in the FIBA World Championship should give him a confidence boost and a running start into the '10-'11 season. However, playing with All-Star Brandon Roy will limit his responsibility, so barring another injury plague he won't be given enough of a role to take home the trophy. 4. Martell Webster: Another Portland player who was restricted to being a shooter in McMillan's system he has been given a chance to be a leader on a very young Minnesota team and should start at the shooting guard spot. He's only 23 and when healthy has contributed well in his 5 years on the League. The pressure from draftee Wesley Johnson and teammate Corey Brewer should keep him motivated too. 3. Anthony Randolph: This guy has been talked about as a Lamar Odom type player since he came into the League, others thinking he can be a Hall of Famer. Finally traded from the horrendous Warriors team where his playing time was erratic at best he should be given the nod to start at either the 2, 3 or 4. However, STATs presence will likely stifle his chances to shine to the fullest at this stage. 2. J.J. Hickson: Left holding the ball in a Cavaliers team sans LeBron this young power forward will be given all the playing time he needs as Gilbert embraces rebuilding. He was dominant in SL and should flourish given more consistent playing time and a more creative coach in Byron Scott. 1. Michael Beasley: Okay, so he did a lot of weed in Miami, but he seems to have put those days behind him, and after seeing a recent clip of him playing at a charity game, I've never seen him so animated or motivated. His game will suit the triangle if he can learn the system and despite Love's stellar play with the USA Team, Beasley is the only player on the roster with superstar talent, despite his inconsistency. Without Wade ahead of him as number one scoring option Beasley should return to his college days when he was a stud. So there you have it, my predictions for MIP; a cross between what I'd like to see happen and what I think will happen. Feel free to share your thoughts or predictions in the comment section.